The scaffolding covered structure that towered over us was underwhelming. Not that I had expected much else. As mentioned before, I had never been a Gaudi fan. But again, delving into the symbolism inherent in every stone and more importantly, the principles of construction, the designer in me could not help but be drawn into the spirit of the Temple Expiatori de la Sagrada Familia, the magnum opus of Antoni Gaudi i Cornet! R would have gladly skipped the tour of this ‘chocolate confection’ as he called it! But the price of traveling with an obsessive, compulsive spouse who needs to do everything ‘right’ is that you get dragged into places you would rather swap for a bar and a cold beer. Since that was not an option in the near vicinity, he reluctantly stood in line with me for the 11am English tour. Our guide was a bit of an automaton and her few attempts at humour fell embarrassingly flat! But she somehow managed to impart a tremendous amount of information about the construction of this basilica that we had been unaware of! To understand the concept of this building one needs to understand the Catenary arch – the curve assumed (with the apex pointing downward) by a hanging chain or rope supported at its ends. 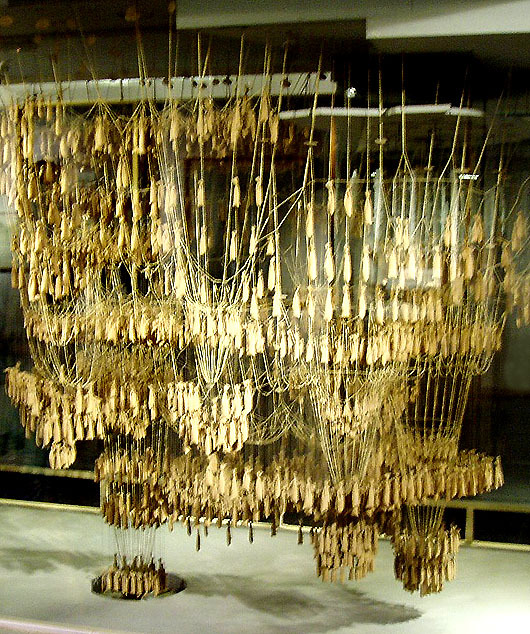 Gaudi suspended strings of the desired length from his layout plan and then worked out the volume and centre of gravity, as well as the optimum incline of his columns to support the roof, from the inverted Catenary arch which was the mirror image of this model!! If you turn the image (below) upside down, you get a fair idea of the final shape and size of the Sagrada Familia! This also eliminated the need to shift the load outside onto external buttresses that was the norm in Gothic cathedrals. Gaudi percieved such buttresses as the main drawback of Gothic architecture and often referred to them as “vulnerable crutches”. His giant Basilica could now stand free and tall with no outside supports! Inverted Catenary arch model. The reflection of the model in the mirror above was photographed and used to determine the volume and center of gravity of the roof and the column incline needed to bear that load! Gaudi reveled in Christian symbolism, and it was given free reign here, in the decorative elements but also in the architecture itself! The eighteen bell towers symbolise Jesus (the tallest and topped by a cross), the Virgin, the four evangelists and the twelve apostles. 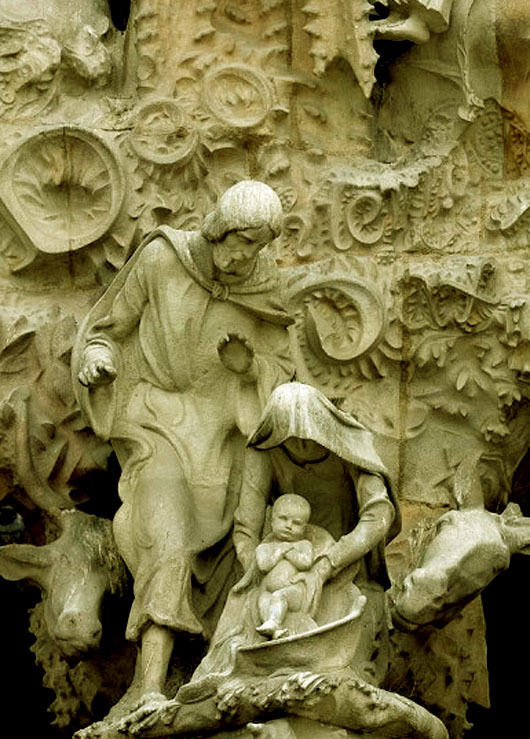 The Nativity facade – the only one he worked on personally – faces East, signifying light and life, and celebrates the birth and early life of Jesus Christ. The Passion facade faces west and the end of day symbolises darkness and death. This facade and especially the portico was designed in Gaudi’s words for the purpose of “giving an idea of the cruelty of the Sacrifice”. Gaudi worked on his dream project for 43 years – almost exclusively after the completion of Casa Mila in 1912 – and knew it would continue well beyond his lifetime. Upon his death in 1926 ( hit by a tram and tragically left unattended till too late, since he wasn’t carrying any identification.) he left behind meticulous drawings and scale models. Some of these were unfortunately lost in a fire and some more destroyed during the civil war. Architects and sculptors subsequently pieced together his original vision from a few surviving models and the wealth of records maintained by his assistants. His spirit guiding them from his final resting place below the crypt. Tower topped with seasonal fruit! Forest of trees – Tree shaped inclined, twisted columns supporting the roof! Apologies if the ‘almost’ was misleading. It is estimated to take another decade, but in the context of 130 years I figured it was almost done 🙂 Thank you for the visit and comment AD! So glad you did Jim! Welcome to my blog and hope to see you around! Thank you Gerry! Have you posted the pics on your blog? Would love to see them. Visiting La Sagrada Familia is one thing I want to do before I die. For someone that’s not a huge fan of Gaudi you do a great job of writing up your visit. I learned things I didn’t know before. I loved seeing this building. Isn’t it fun how some tour guides really try super hard to be funny and it just doesn’t work. It has to be a tough gig. I am sure it is. Don’t envy them one bit! Most welcome Sonel! Than YOU for your visit and kind comment! Hi Madhu. When I was there in 1988, it was 103 degrees out, the building was surrounded by scaffolding and looked like a drip sand castle to me. We weren’t allowed inside. I didn’t really appreciate it as much as it deserved to be. I appreciate your storytelling, which highlights it uniqueness, and the human aspect of its building. I know I will go back one day and see it in another light. I think you should if you can. It is an impressive structure given all the architectural feats, whatever your preferred aesthetics. To me the attraction was purely architectural. Otherwise it felt more like a museum than a church. Maybe that will change when it is fully ready and all the scaffolding and workmen are out. Great post and photos. I want to see this in person someday. …”chocolate confection” 🙂 The arch model is so fascinating, I remember having difficulties leaving it. Alone. Thanks for yet another magnificent trip with Madhu’s Travel Agency. I can see what you mean by never having been a fan, I took one look at the first picture and din’t really like it myself. But after reading your post, all the details and planning, it is really impressive. That is how I felt too! I never liked him before I went to Barcelona, but returned a huge fan! Thank you for dropping by Khaula! When I went in 2009 the guides said that it would require another 30 years or so until completion – with all those spires finished the church will look so different! This was one of the few places in Barcelona where I didn’t mind the crowds nor the admission prices. I would have liked to go up to the tower but the queues were just ridiculous! Amazing. I love his works! Thank you for taking the time to photograph this incredible structure and doing such interesting follow-through. I am awed by the mind that could envision the stress points of the arches and all. I wonder if the word gaudy came from here. I too thought it did, but the word ‘gaudy’ apparently predates Gaudi! Appreciate you dropping by to comment! Absolutely! There are so many details, it is impossible to capture them all in a couple of hours! Thank YOU for reading! Always a pleasure Marcy! Thank YOU for taking the time to read and comment! The arch model is so cool, I loved looking at it when I went. Great photos of the details in the building! Isn’t it? I was so fascinated by it as well! Thank you for the visit and comment Jessica! Thank you for the beautiful photos and wonderful tour Madhu! What an amazing feat of design and construction! Glad you enjoyed it! Appreciate your taking the time to read! Thank YOU Max! Seeing all of it would take a few days! 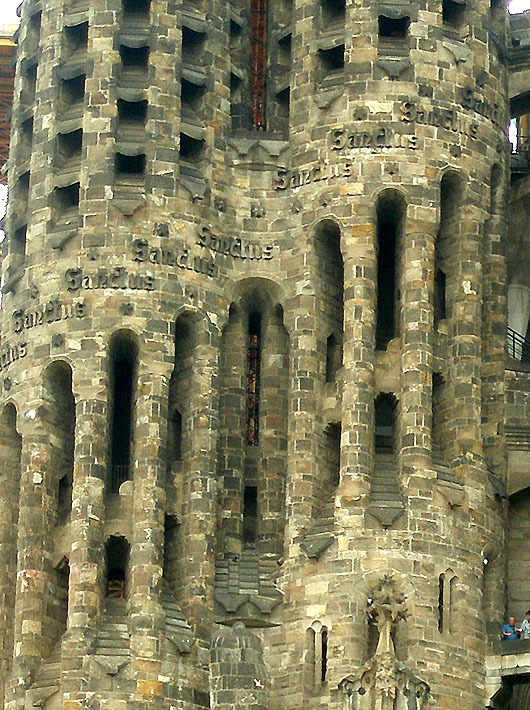 Gaudi is one of those people that we call visionary. I truly admire his work and unbelievably creative ideas. 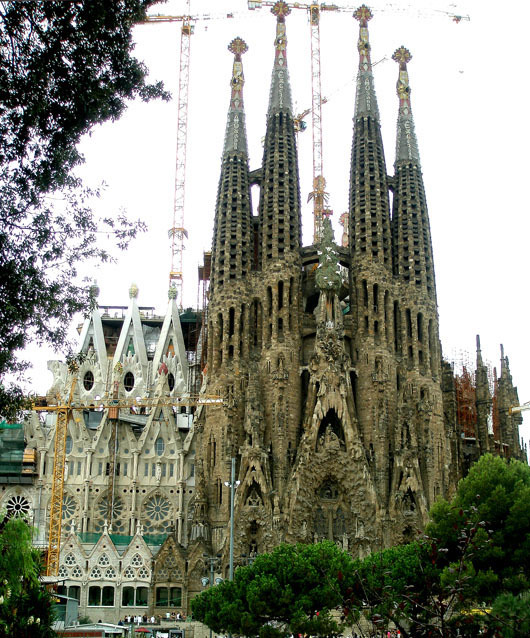 Visiting Sagrada Familia itself has been one of the things that I really want to do when I go to Europe again one day. Once for the near future, and the second time when it is completed. Great photographs as well Madhu! Yes! And one needs to see it first hand to appreciate his work and understand the concepts behind them. Always a pleasure to get feedback from you Bama! You take us to some amazing places with your beautiful photography. Thanks for sharing. Thanks Francine! Your kind comments make me happy! it is an extraordinary place, and your photos are marvelous! Gaudi was like a magician, wasn’t he. Although probably not most people’s favorites, his design is still beautiful in its own way. Thank you for sharing all of your research and photographs, its time consuming and hard work, and you do it so well! How nice. It’s one of my favorite architecture which I want to visit someday. Thank you! You will love it Cocomino! Spectacular architectural details. And the statues, just magnificent. Thanks. Thank you! These are just a small smpling of what there is to see! I was in Barcelona in 2000 and remember my friends who were taking art classes at the time sharing many of the same details. I also seem to remember that the sculptures even at many meters above are still perfect – he was sculpting for the eyes of God alone because at that point there were no cameras/hoists capable of taking pictures there. Thanks for bringing back the memory. Such intricate art work. Thank you Ledia! You are very welcome, Madhu. The time and love it must have taken to create this masterpiece. Wow! I loved his Catherdral from the first time I saw it on a TV program many years ago. I knew one day I would see it in person. The first time I stood infront of it I stood in awe dwarfed by the size and in the erie glow of the street lights.It looked like melting wax of a candle, or a sand castle melting with dribbles of water. I climbed inside one of the towers… amazing! 2 years later I returned and saw some of the progress of the building. Seeing how much is completed now wants me to go back again. Hope you do 🙂 It is a truly amazing piece of architecture! One day… I also want to go back and explore more of his houses. We went to the Park Gruell Park… amazing view of the city and his cool designs. Did you also go? WOW!! Stunning architecture! I wonder what was the intention of all the stairs leading off the edge haha. Great pics! Thank you Scott! If you are referring to the second image those are window sills in the towers! I had never been a Gaudi fan either…but this past December/January I visited Barcelona for the first time and finally I understood just how amazing his work was/is. Beautiful! Exactly how I felt! His work needs to be appreciated first hand! Thank you Ameena! I love that I can learn so much from your posts, they are always so informative and interesting and accompanied by your beautiful photographs. Thank you! Thank you Tania! You make me feel good 🙂 Loved your photo of the ceiling, but then I love ALL your photos! Great photos and history….incredible to believe he worked on it for 43 years! Thanks Angeline! It is truly incredible! Great photos – I can really appreciate the enormous amount of skill that has gone into the design and construction. It is truly brilliant but I can’t help finding it quite …. ugly! Maybe ‘ugly’ is not the right word, for in smaller sections and close ups I find the work fascinating, but en masse it looks really messy (to my eye). I don’t naturally feel drawn to the style like I do to other types of architecture, and I don’t really understand some of the concepts – fruit on the top of the pillar??? I really did like the Passion Portico though, that felt a bit more cohesive rather than a lot of things clustered together in close proximity. Still, it is a fascinating study in architecture and construction. Thanks Madhu!! Your photos and commentary are always brilliant! Appreciate that Louise! Gaudi’s decorative elements ARE over the top! I too preferred the stylised sculptures of the passion facade to the overly embellished nativity facade! All I can say is…MORE!!! You made my day 🙂 Thank YOU for the visit and kind comment! Thank you for this oppotunity to travel around the world by visiting your blog! You are most welcome Madalina! Thank you for your visit and the kind comment! Just catching up! As always you satisfy my thirst for detail, both pictorially and historically. Did you know there was serious discussion – for a moment or two at least – about turning the whole thing into a metro station? I’m glad of your fabulous pictures because all my visits to Barcelona were in the pre-digital film-rationing days, and I’ve very few that aren’t degraded. I have loads of degraded images from the rest of Spain and Greece 😦 Might be reason enough for another visit. Oh and what about it’s HOT in Chennai and just wonderful on the Mediterranean right now? That too 😉 You cannot imagine how unbearable it is right now! Or how much worse it will get before it gets better! I probably could, but I don’t want to, OK? Barcelona is one of my favorite destinations. These photos reminded me of my last trip there. Thanks for sharing. Thank you so much for taking time to provide the history! Enjoyed reading and learn about it.